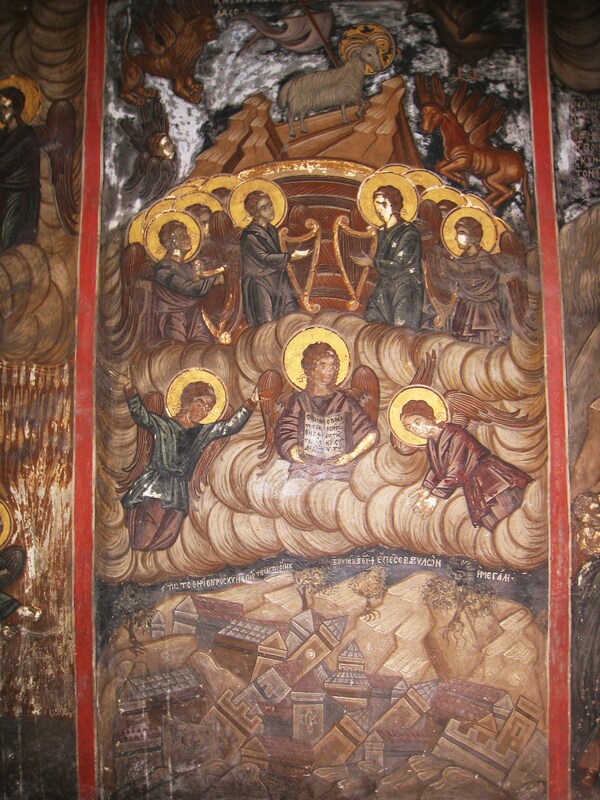 In post 1100 I started with the Apocalyptic scenes from the portico of Dionysiou, part two is in post 1103. Today we continue in the protico at number 3 (for the plan see 1100 – link above- ) : Chapter 14: 14-19 of St. John: “of the Lamb and of the virgins that follow him. Of the judgments that shall fall upon the wicked”. 14:19. And the angel thrust in his sharp sickle into the earth and gathered the vineyard of the earth and cast it into the great press of the wrath of God. 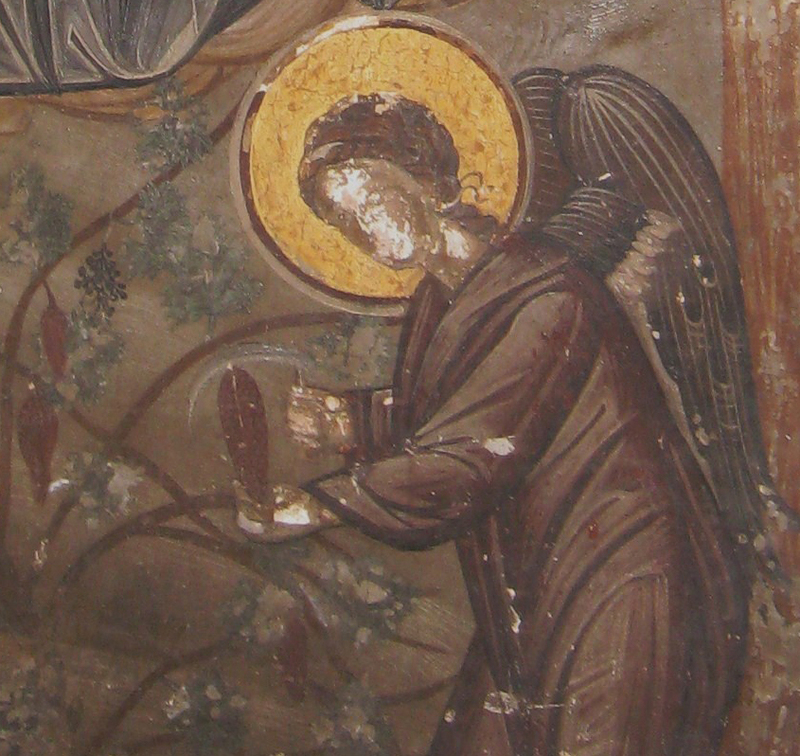 Detail of the fresco above: an angel harvesting grapes with a sickle. The next scene shows the beginning of Chapter 14 with “a lamb standing on mount Sion” (14:1-3). “I heard a voice from heaven, as the noise of many waters and as the voice of great thunder. And the voice which I heard was as the voice of harpers, harping on their harps. And they sung as it were a new canticle, before the throne and before the four living creatures….”. 14:7. Saying with a loud voice: Fear the Lord and give him honour, because the hour of his judgment is come. And adore ye him that made heaven and earth, the sea and the fountains of waters. 14:8. And another angel followed, saying: That great Babylon is fallen, is fallen; which made all nations to drink of the wine of the wrath of her fornication. 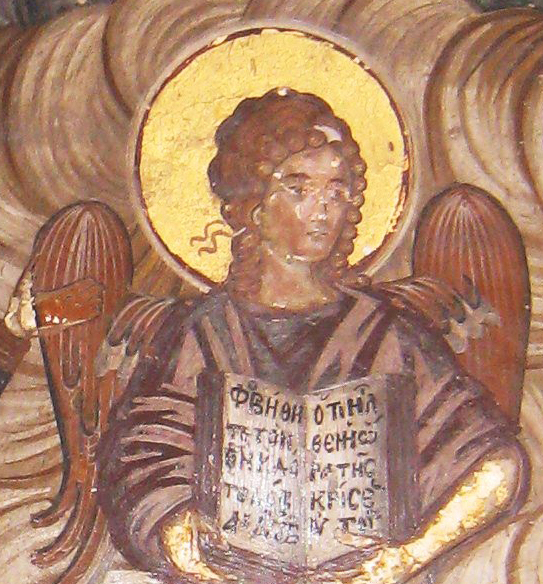 A detail of the last painting: “an angel flying through the midst of heaven, having the eternal gospel”. 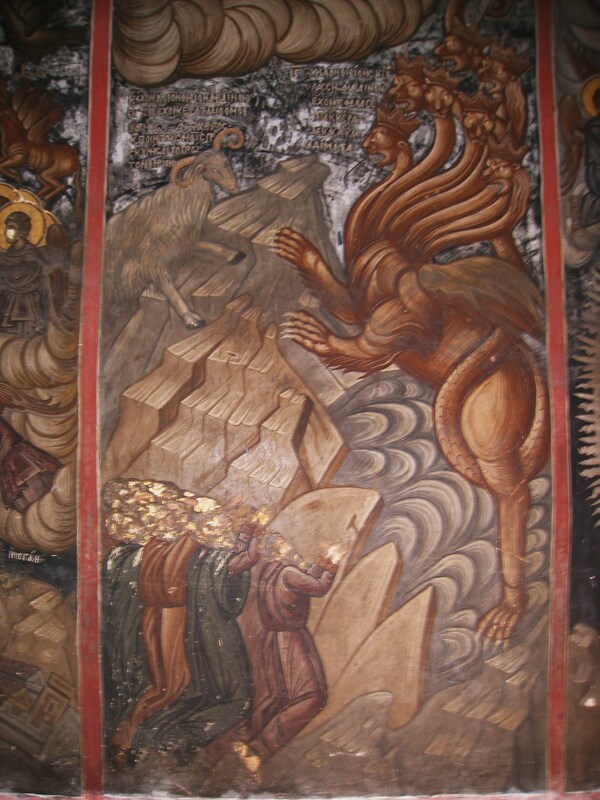 The next scene is Chapter 13 of St. Johns Apocalypse: “of the beast with seven heads and of a second beast”. He says in verse 2: “And the beast which I saw was like to a leopard: and his feet were as the feet of a bear, and his mouth as the mouth of a lion”. 13:11. And I saw another beast coming up out of the earth: and he had two horns, like a lamb: and he spoke as a dragon. (Another beast: This second beast with two horns, may be understood of the heathenish priests and magicians; the principal promoters both of idolatry and persecution). According to verse 8 “all that dwell upon the earth adored the beast”: look at the damaged faces of the adorers!